A 5-Day Training of Trainers (ToT) course on Legislative Research is underway at Chuniding Resort, Thimphu. The training is being attended by 9 senior officials from both the Houses. 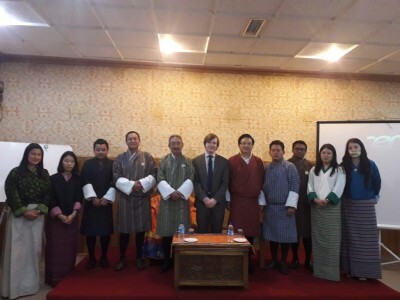 It is organized by the Secretariats of the Parliament of Bhutan with the financial support from International Institute for Democracy and Electoral Assistance (IIDEA) and it is being facilitated by a resource person from the Westminster Foundation for Democracy (WFD), House of Commons, UK Parliament on a pro bono basis. Further, the international expert is assisted by a local consultant. The training is being conducted with an objective to build in-house capacity to provide training on legislative research. Following this course, the team will facilitate 5-day training on Legislative Research to Asstt. Research Officers in Paro starting next week. The training will conclude on 10th of August 2018.